1. Go to Start > All Programs | Accessories and locate the command prompt program icon. 2. 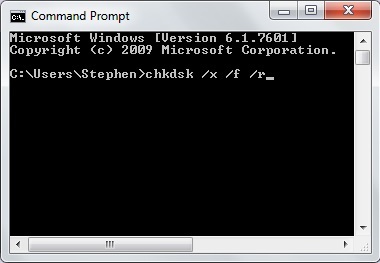 Right-click on the command prompt program icon and, in the menu that appears, click Run as administrator. 3. If the User Account Control message box appears, click on the [Yes] button. 4. In the command prompt program window that appears, type chkdsk /x /f /r. 5. When the message "... Would you like to schedule the volume to be checked the next time the system restarts?" appears, enter Y and press [Enter]. 6. Close the command window and restart the computer. 7. Upon restart, the message "checking file system ..." will display. Be prepared for this process to take a considerable amount of time.